There is a long-term relationship between corporate earnings and the stock market (adding up the historical dividend yield and earnings growth is a good approximation for the very long-term performance) but this doesn’t necessarily hold over the short- or intermediate-term. One-year aggregate earnings results are even harder to use as a signal. The investment world pays very close attention to quarterly earnings numbers to gauge market fundamentals, but in aggregate they’re not a sure thing for the direction of the stock market. It’s not good or bad that matters in terms of earnings performance but better or worse than the built-in expectations. 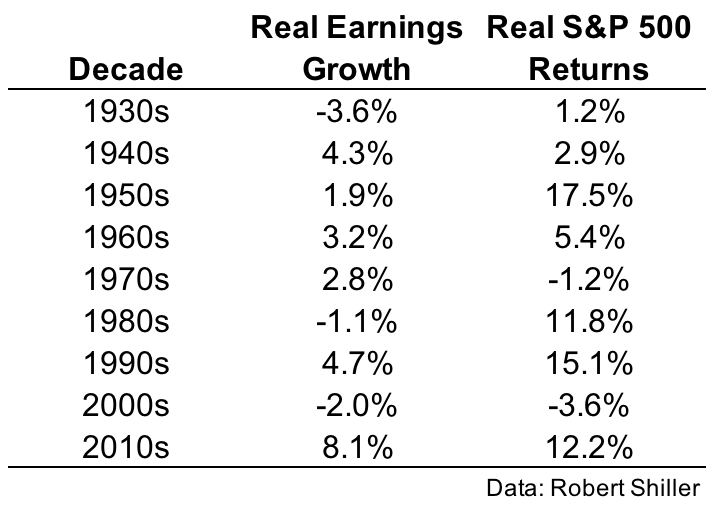 Wonderful earnings growth can be all but lost to high inflation (1970s) which tends to hurt stock returns. 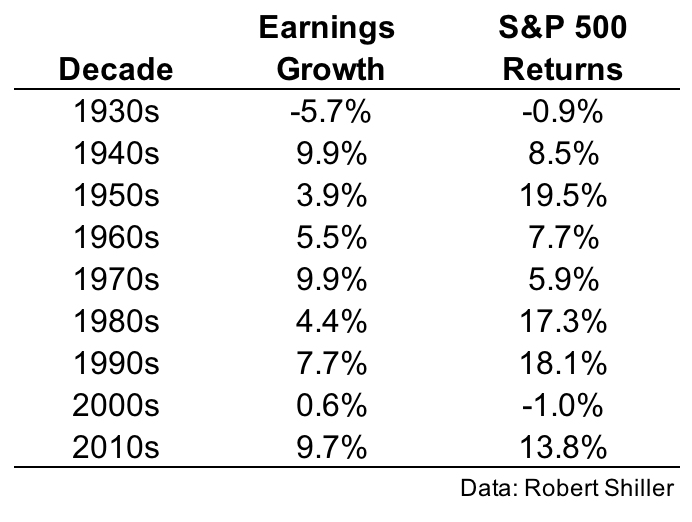 Poor earnings growth doesn’t necessarily spell doom for stocks (1950s). Occasionally, earnings growth and stock performance line up decently well (1940s & 2010s). Stating the obvious, the 2000s were a terrible time for investor and corporation performance considering the decade was bookended by recessions and stock market crashes (although it was a pretty good time to be a consistent saver who kept plowing money into the market). The 1950s might be the most underrated decade in terms of market performance. This is partly due to the fact that most people gave up on stocks during the 1930s and 1940s following the Great Depression. On a real basis, both the 1970s and 2000s were lost decades. That’s the risk part of the equation when investing in risk assets (the 1930s real returns were actually helped by the fact that there was deflation). It’s surprising that the real returns thus far in this decade are higher than they were in the 1980s (which obviously had higher inflation). I’m not sure many people would believe you if you told them this fact. Many people are under the impression that the stock market has detached from fundamentals. That’s always a possibility but earnings growth has more or less kept up with stocks as mean reversion has been strong in both measures this decade. By the end of 2017, this decade is on pace for the highest real rate of growth in earnings (which probably says more about how depressed earnings became during the financial crisis than anything).